Trimax Machinery produces top-quality crushers to help quarries operate efficiently at their highest capacity. The company’s specialised machinery also ensures a better quality of cubical aggregates. Trimax produces and supplies crushing machines which cover all stages of the quarry crushing process. The company’s range includes primary, secondary and tertiary crushers, feeders and vibrating screens. 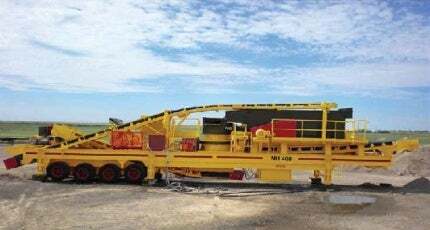 All equipment is designed to meet the highest capacity requirements of modern quarries, with reliable performance, high throughput and for reduced downtime periods. The Trent and Trident jaw crushers are industry leaders, due to their incredible crushing capacity and efficiency. Both machines feature innovative V-shaped crushing chamber designs processing a larger amount of material in a primary crush. The Trimax NS and NH cone crushers were developed to meet demanding secondary and tertiary production stages. The high-speed cone crushers are relatively small and light, for easier transport and maintenance. Their field-proven design enables high-capacity and efficient crushing. The high-speed cone crushers control the downpour of material, enabling as much of it as possible to pass through the crushing chamber, for greater control over the size and shape of the end product. At either end of the process are the ADplus grizzly feeder for wide capacity loading and the ADplus vibrating screen for efficient separating. All Trimax Machinery equipment is built to a high quality standard, using an excellent grade of materials and technical knowledge. Trimax offers a range of used equipment for smaller budgets. Customers can purchase a low-cost and high-output crusher machine with the assurance that it has the trusted Trimax Machinery brand and has passed the company’s stringent quality assurance checks. Before any equipment is re-sold, a team of engineers performs a repair, re-condition and re-test assessment to ensure it meets the company’s standards. Used equipment is backed by a three-month warranty and reliable after-sales service, to ensure that customers get the best from the Trimax products. Years of experience and industry insight has put Trimax in the ideal position to advise quarry companies on tool purchasing. Whether selecting a brand new machine, a re-conditioned one, or taking advantage of the company’s after-sales care and advice, the Trimax team can help customers get the most from their quarry operations. We have just returned from exhibiting at Bauma China 2016 in Shanghai. Trimax crushers use top-quality parts and are supported by an unmatched customer service. Download the free crusher brochure for more information. Trimax Machinery is an engineering company with its headquarters in Singapore, with subsidiary companies in Malaysia and Indonesia through Trimax Machinery (M) Sdn Bhd, Trimax Crushing & Screening Sdn Bhd, Sanmax DS Sdn Bhd and PT Trimax Machinery, as well as distributors in various other countries. Today, we have over a hundred crushers in operation in various sites around the world. We are pleased to announce the launch of our newly revamped website that aims to create a user-friendly browsing experience for our trusted and valued customers. Trimax Machinery has a new Facebook page for the company's latest news and updates. Trimax Machinery will attend annual Constech 2015 exhibition, which will be held from 27 to 29 March in Bangkok, Thailand. The venue for this exhibition is the IMPACT Exhibition and Convention Center, Bangkok Thailand. Vietnam Service Co-Operation and Trading JSC.